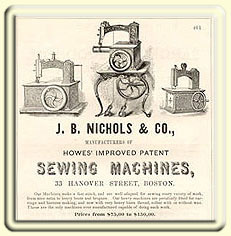 Antique sewing machines - about us. The passion of collecting antique sewing machines, and researching their history, has been with us now for many years. Being UK based, our efforts have been concentrated towards British manufactured and marketed machines. A desire to seek out the oldest and most unusual models has led to a broad knowledge of sewing machines produced during the 1800s. Unfortunately this limits our insight into newer machines and manufacturers. Please note, we do not supply valuations for machines. Such emails will not be acknowledged. Also, we cannot reply to all requests for sewing machine information, particularly if we have no details available on a specific maker or marque. Considerable time, effort and expense has gone into researching and cataloguing much original material found on this site. Information and images published are intended for private interest or research only, not for republication in any form without the express written permission of the authors. The harvesting of images from this site for re-use elsewhere is theft. Breaches of copyright will be dealt with accordingly. Copyright &COPY;1999-2010 by dincum. All rights reserved.